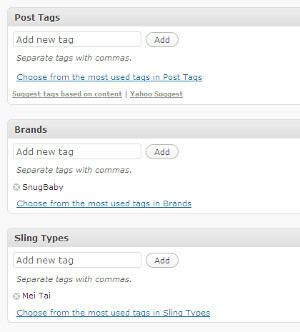 WordPress lets you categorise your posts according to “tag”, and “category”. Which is fine. However, for some time now WordPress has supported a concept called “Custom Taxonomies”. Which is a long winded way of saying “We’ll let you choose how your organise and present your posts – however you want”. This isn’t something I’ve ever felt the need to use before (I’m happy enough with tags on this blog) – however having used them recently I’ve really begun to appreciate how powerful they are – and I’m amazed that more people don’t use them to create a more sensible structure to their WordPress sites. So, what can taxonomies do for you? The site I built this for is a resource all about baby slings, the different types, the different brands, and people’s experiences, of finding, choosing, and using them. Tagging just seemed to create a big, hard-to-navigate tag cloud that didn’t create an easy way for people to find the right content on the site that was going to be useful to them (Feedback has suggested that people are either looking for information about a particular brand, or a specific type of sling irrespective of brand). So, out went the “tags” (We removed them from most old posts, don’t add them to new posts, and got rid of the “tag-cloud”). Next step was to install Joost de Valk’s Simple Taxonomies plugin. This is one of Joost’s simpler plugins. In general all it does is let you create a taxonomy, and manage the terms within that taxonomy. 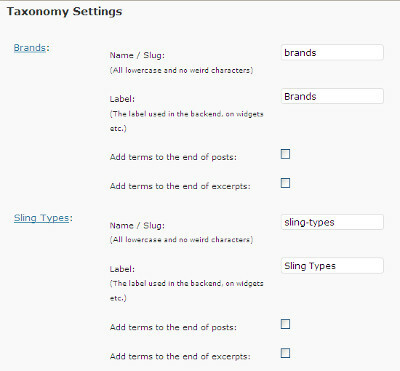 So, using the plugin, we created two taxonomies – “Brands”, and “Sling Types”. Next step was to go back through our posts (Fortunately this was in the early days of the site! ), and correctly “tag” the posts against the right taxonomies. So on the SnugBaby review, we set the “Brands” to “SnugBaby”, and the “Sling Types” to “Mei Tai”. Now we’ve got all of our posts beautifully organised, but we don’t have a way to view them. Before we get to that though, there’s just one more step. For every “term” (ie, for every brand, or sling type) we need to provide a description. Your new taxonomies can be found in the “Posts” section of the WordPress backend, simply click on the taxonomy, e.g. “Brands”, then work your way down the list adding a useful description. Now we can actually start presenting this information sensibly! Now, we’re going to use that list of “terms”, and their descriptions, to create a top-level list of “brands”. Download the file below, and save it in your WordPress theme directory. We called it “brand-directory.php”, but the name doesn’t really matter. And there you have it, a dynamic data driven directory that keeps itself up to date whenever you “tag” a brand – all you have to do is add a description for the brand! For an example see the “Get Your Hands Back!” brand directory here. At this point in the code, $query->posts should contain all of the matching posts so you should just be able to cycle through them and output whatever you want. Have a go – and if you get stuck let me know and I’ll whip up a quick sample! What if you had multiple levels that you wanted to group by. So you had carriers, and under that you had left shoulder carriers and right shoulder carriers. Would you create multiple pages to create the category structure? Hi Michael, thanks for the comment. In all honesty this approach isn’t really meant for hierarchical data (Although you could do that if you wanted) – if I was doing subcategories then I’d just use categories – or set the taxonomy to be hierarchical. Hey Lee, After banging my head on the keyboard for a few hours last night, I finally figured out what you already knew. 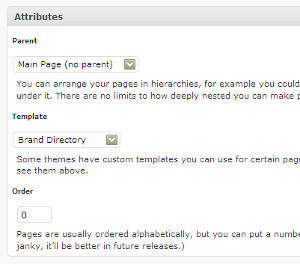 I’m hoping that WP 3.0 will incorporate hierarchical tags more easily, because then directories should be much easier. a) You could tag each song (post) as belonging to a particular artist, and also an album, but that seems redundant. In reality, the album should be “owned” by the artist. So a post should just need the album name, and the artist could then be retrieved from the album? b) Similarly, each artist (let’s say for sake of argument) only has one record label. Seems redundant again to tag each track with a record label. It should be the artist or perhaps album name that is tagged with the label. Are these structures possible with custom WP taxonomies? Or is just a case of attaching all the tags to the posts and accepting some duplication? Any insight would be welcome ….. Yes – although in reality a lot of albums (Think compilation albums) break this model, e.g. an album can contain lots of different artists. I think you probably realised that though!. This is a taxonomy archive page, so for example b2boutique is a term within the “vendors” taxonomy. We then list the relevant terms within other taxonomies that make sense for this vendor. If you had a post per song (For example), then you would have to tag it with the artist, genre, label, and album. Then you could build (For example) an “artist directory”. For each artist you could then query the posts with that artist, to find out what albums, labels and genres you should list to enable the user to “drill-down” to the next level. The site I linked to above has to manually link vendors to sling types – since posts are tagged with multiple different vendors, sling-types and brands. I think “artist”, “label” and “genre” archives would work like this, and not show a list of posts. The “album” archive would probably be the only one that displayed a list of “posts” with this tag so that you can get to the actual song posts. , to find out what albums, labels and genres you should list to enable the user to “drill-down” to the next level. Yep. That’s exactly the sort of approach I eventually realized would be needed. Each post is a song, and then just tag everything from there, and do the work in the queries …. thanks for the reply!! Nice plugin, and thanks for the comments Michael. (2) or have taxonomy terms in the post permalink? Not that I’m aware of – at least the permalinks only suggests that you can do this with %category% and %tag%, not %term% which is what I’d expect. Does this plugin work on WordPress newest version 3.0? That’s a good question. The blog that this article was written about is still on 2.9, but I’m intending upgrading it over the next few days – I’ll report back and let you know! I imagine you probably could. You could make the theme file include a specific template to do the functions if it encountered a certain URL or similar, or maybe use rewrite rules or similar – sorry I can’t help more with the exact solution but that might set you off in the right direction! You should be able to adopt the same process for custom taxonomies rather easily. Hey Lee! And is it possible to sort the terms of custom taxonomy? (I need to show terms in special order on the page.) Thank you! It depends what you want the order to be. get_terms() supports a second argument to specify the ordering, e.g. It lists both levels and under it “1 related article” which is just a link to the archive of each taxonomy. In other words it’s not linking to the posts, just the taxonomy tags. I took a quick look, and it looks like you’ve sorted this now? The brand-directory.php posted in the article does exactly what you’re after (If I’ve understood correctly). I consulted http://mondaybynoon.com/2010/09/06/wordpress-archive-pages-taxonomy/ and figured out a hybrid between the two. Thanks. I love the look. Oh wait, sorry, Yes I sorted the problem. Wrong link above! I was trying to get both an archive and a grid front page working and confused my links! The archive is all your code with a modification because I didn’t change the subdirectories of my custom posts. that was great help! really thank you. I created custom type posts and then add them a taxonomy to categorize them, your code gave me an idea how to fetch only post with specific term. Simple Taxonomies plugin is good and works with WP 3.1 but I now prefer adding new taxonomies in functions.php because the minute you disable the plugin, all your custom taxonomies are nowhere to be found. I almost had a heart attack when I did this by accident but luckily all my custom taxonomies came back to life the minute I enabled the plugin again. Thanks alot for providing this template. I’m using it on WP 3.1 and it’s working great. I’m wondering, though, if there’s a way to paginate the listing, so, say, only 10 terms show per page? Hi – I suspect that this is because your base WP entry is a “page”, and they don’t normally contain paginated content – they’re just static. I can’t think of any easy way around that …. Thanks for the code, Marion. Unfortunately, I was never able to get it working; most likely because I was indeed trying to set it up on a page. I’d be happy to pass on the code if anyone wants it.. Thanks for the tutorial. It is helpful. I want the drop-down to show only the latest children: District X and District Y. (2) To automatically select all parents of a selected child term when saving the post. So, let us say the user chose District Y in my previous example, then both Package Y and Zone Y should be selected as well, behind the scenes. Could you help me with that please, or point me out to any helpful reference? It’s not something I’ve come across before I’m afraid. I see. Thanks anyway, Lee! I dropped a quick reply on that thread. Interesting interpretation of “long winded” you have there :p.
This is exactly what I am after but the file is no longer available – I tried recreating with the code you have above but I’m doing something wrong! Are you able to upload the brands-directory.php again? Thanks Lee! Appreciate the speedy response! Not exactly what I was looking for but thanks for the help! Trying to make a product page with thumbnails.